Leaf-Spring Front Eye Poly Bushing Set, Black - Fits 1964-73 Mustang and various Ford/Mercury models from 1964-77 with 2" bore x 2-1/2" wide spring eye and 1/2" bolt. Replaces RB82 OEM bushing. 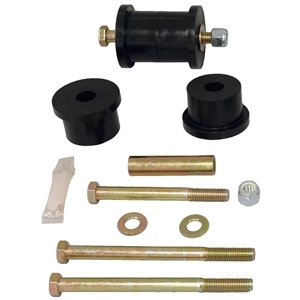 Includes poly bushings, sleeves, Grade 8 mounting hardware, and poly lube.